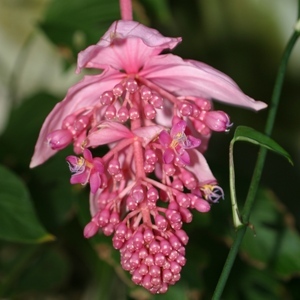 The hanging ‘garlands’ of deep pink flowers of Medinilla magnifica provide an eyecatching focal point in the Tropical House at this time of year. In fact we believe ours to be the biggest in the UK! The stunning pink ‘petals’ are bracts (modified leaves) which surround the true flower parts and developing seeds. This species is evergreen, bearing attractive, dark green glossy leaves with boldly patterned veining. The plant is frost tender: if you are tempted to try to grow it, you will need to be able to provide minimum temperatures year round of 16 to 18C (61-64F). Humus rich soil and partial shade are also needed – mimicking the growing conditions that this species finds in the tropical rainforest of the Philippines, its natural geographic range. In the wild it tends to be epiphytic, anchoring itself on other plants rather than in the soil. So, when you are looking for it in our tropical house remember to look up!